Akamas is the easternmost point of the three major flora zones of Europe, therefore the number of plant species found here runs up to 600, of which 35 are endemic. The variety of fauna is also impressive: 168 bird species, 12 mammals, 20 reptiles and butterfly species of which the endemic Glaucopsyche pafos butterfly is said to be the symbol of the area. 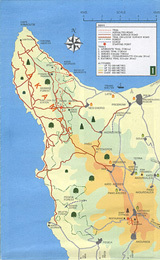 Akamas is situated at the westernmost point of Cyprus. According to one version, the area. Took its name from the Greek mythological hero Akamas, son of Theseus who came to Cyprus after the Trojan War and founded Akamantis. Akamas was also the place where Aphrodite and Adonis had their love trysts. It is an area of incomparable natural beauty. Almost all the geological formations found on the island are present in the area Akamas is ideal for walking, cycling, swimming, diving, fishing, exploring, cruising on small craft, and bird watching. Starting point: Baths of Aphrodite. The section between the Baths and Pyrgos tis Rigainas (the Castle of Regina) is shared with the Adonis trail. The trail follows a rising path to the hill known as Moutti tis Sotiras (370m) and this can be quite tiring, especially in summer There are springs with drinking water at two points, one at Pyrgos tis Rigainas (the Castle of Regina) and the other at Kefalovrisia. Starting point: Baths of Aphrodite. Like Aphrodite Trail, the walk can be quite tiring. Two springs of drinking water can be found at Pyrgos tis Rigainas and Kefalovrisia. Points of interest: From the western part there is a view of various beaches of Akamas, such as Lara Bay, Tzioni, Karavopetres, etc. 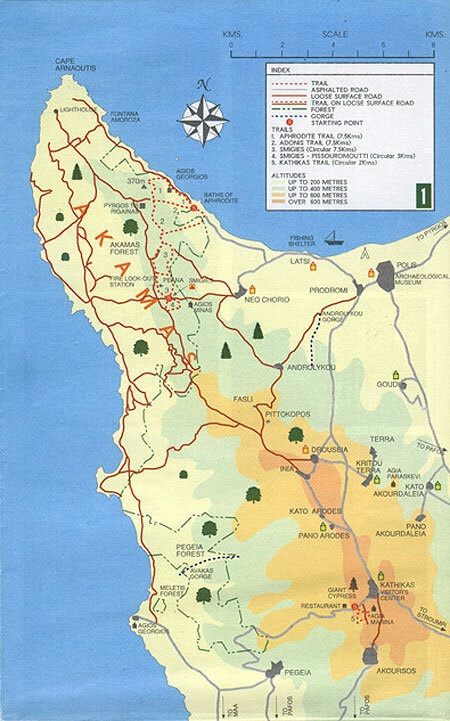 Points of interest: View to the east of Polis Chrysochous Bay, Latsi, Pachyammos and Pafos Forest, and to the west Lara Bay, Tzioni, Karavopetres, etc. Points of interest: Rich growth of Juniper Phoenicia, pistacia, etc Views of Polis Bay to the northeast and beaches of Akamas to the west. Starting point: 2 km from Kathikas towards Pegeia, near "Kyparissos" restaurant length: 2 kms Time: 1 hour Points of interest: 800 metres from the starting point there is a stone-built water fountain Agia Marina chapel in the area.